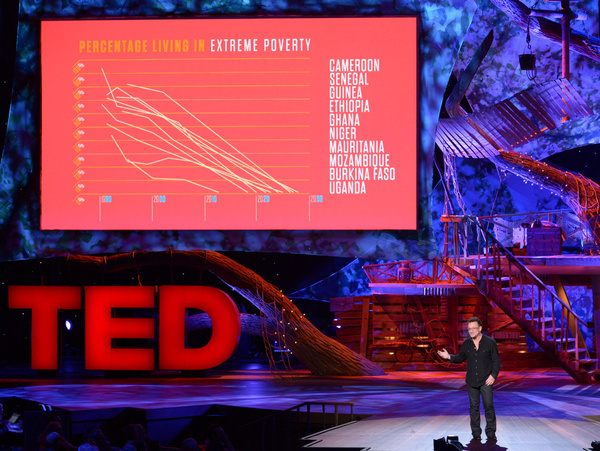 Bono has been speaking at TED2013, accepting the challenge to put 'the last 25 years of anti-poverty campaigning into 10 minutes'. His passion, he explained, was countering what Nelson Mandela called 'that most awful offense to humanity, extreme poverty'. How would he do it? With the facts. 'Exit the rock star. Enter the evidence-based activist - the 'factivist'. Since 2000, eight million AIDS patients have been receiving retroviral drugs; malaria deaths have been cut by 75%; child mortality rate of kids under 5 is down by 2.65 million deaths a year. The number of people living in soul-crushing poverty declined from 43% in 1990 to 33% in 2000 to 21% by 2010. But if that's you, that's still too high. How can the positive trajectory continue ? Read more on the TED blog - we'll let you know when the video goes live. As always a great speech, thanks for telling the world, that we all are ONE, and that our actions affects everyone, and everything in this planet. Just want to explain my point with the Ancient Egypt topic, just for be fair. Because the Pharaon was not a tirany, he was in charge for keeping Egypt in balance and equality. The reason of the temples and pyrimids are because they believe in the great connection between the universe and the human life, so the people who design and built these monuments were completly agree. They were good people. The work you guys do in addition to being rock stars is one of the reasons I love U2. Anyone out there who would like to help a child in poverty, I mean actually sponsor, provide for, and get to know a child in another country, check out www.compassion.com. A wonderful organization. hello bono! as always you make every event leading to the question of Africa! and so once again I give you my highest esteem for your person and as a political activist and obviously as a rock star! I can not wait to see you on stage with your friends! U2 FOREVER! VIVA ITALIA!!!!! Thanks Bono for reminding us that we need to care for the least of these. Anything we can do to eradicate poverty will be profoundly just.